My next 90 Day Keto Challenge starts soon. Would you like to join me? It includes weekly webinars, meal plans and shopping list, a workbook, and private online support group. For more info, click here. Did you notice that I took off the word “experiment” in the title? I’ve decided this is no longer an experiment, meaning something that is temporary and only done for a trial period. After the life altering health improvements I’ve experienced, I’ve decided that this is my new way of life. Who would ever want to go back to feeling miserable all day and night? This month, along with my normal report of health improvements and challenges, I’ve included some Frequently Asked Questions that I have been getting recently. In some ways, month four was quite different from months one through three. 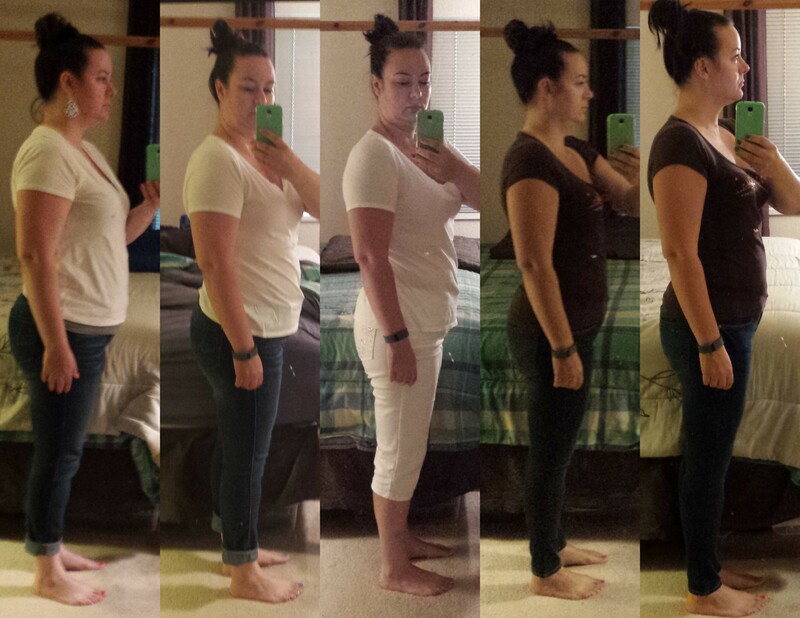 The biggest difference was that my weight loss slowed considerably. I also started to exercise a lot more, incorporating weight lifting and lots more walking. In most other ways, month four was business as usual for my keto life: I continued to experience health benefits and improvements, plus I’ve noticed even more. The slowed weight loss did begin to play mind games with me, since my weight loss up to this point had been relatively effortless. I had times where I questioned if I was doing something wrong, if I might be sliding back into old habits and underestimating portions, if this wasn’t working any more, if I’d ever be able to lose any more weight, etc. A friend pointed out that I was addicted to big scale losses! And she was right. What I had to realize was that since I added three times per week weight training, plus I was walking a couple of miles per day (my car broke down and I had to walk everywhere), the slowed weight loss was likely due to body composition changes, that is, gaining muscle while losing fat. My son suggested that I look to body fat changes instead of scale changes. 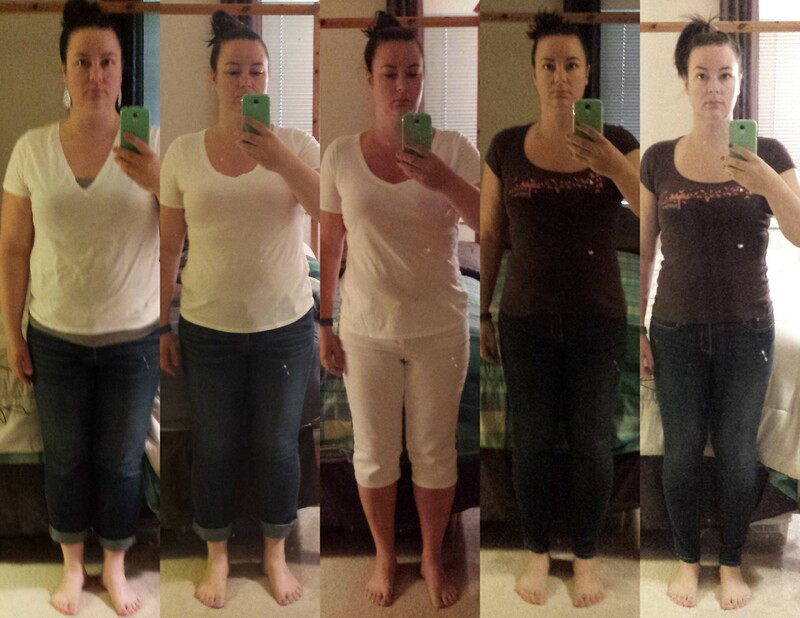 And when I did, I was reassured that my body was changing in ways that the scale won’t show. For example, the first week of September, I lost 1 pound of fat and gained 1 pound of muscle, which of course would not show on the scale. On my Omron body fat monitor, it did show as a loss of 0.5% body fat though. This change would also not have shown on any measurements I took, because a 1 pound change over my entire body would be very minuscule in any one place. Overall, I did lose another 3/4 of an inch off my waist over the last month, so there were changes that did not reflect on the scale (which only showed 2.5 pounds lost over the last month). Compliments on my skin and appearance all the time. People I know are frequently saying my skin looks great, that I’m glowing, that I have great skin, etc. Urinary incontinence gone. Something that happens as we age, or after women have a child (or so we’ve been told this is “normal”), is a little leakage after urinating, coughing, or sneezing. I used to have a considerable dribble after urinating. This was something that actually disappeared a few weeks in, but I just now realized that it is gone. Ability to resume my private practice part-time. This is a result of being able to think clearly, focus, handle stress better, and have more energy. I now offer ketogenic diet nutrition counseling, both online (phone or Skype sessions) and starting in October, 2015, I will be seeing patients in person in Redmond, Washington, USA. No more stiffness in knees and ankles in the morning. Even prior to the car accident, my ankles and knees would be stiff in the morning. No more! This is also an improvement that occurred some months ago, but just now noticing. Temperature tolerance. Before keto, I could not tolerate heat at all. I would get delirious when ever my body temperature would rise, and I could not tolerate the summer heat. After my car accident, I also could not tolerate cold temperatures, either. I would get really dizzy and lightheaded. After keto, this was the first summer I actually enjoyed the summer heat and sun. Additionally, unlike most people who lose weight, I’m not constantly freezing, which is a sign that my metabolism is NOT slowing down to compensate for reduced energy intake, like on most diets. Increased strength and endurance. Over that last month, I was able to add weight training, and increased walking and cardio considerably, even doing a couple of yoga sessions. My strength is still very low compared to where it was prior to my car accident, but I have been able to stop physical therapy as I have progressed to an actual gym for exercise. Tons and tons of energy. Able to walk for hours, workout and more, even when I haven’t eaten for the day. This was such an amazing feeling, that I had to create a separate blog post about it. These are actual questions that I’ve gotten in person, through email, online messages, and so on. Some of these come from people who are skeptical that a keto diet is healthy. Others are thinking about beginning a keto diet themselves and want to know more about what it is like to follow this lifestyle. And others likely know that a keto diet would benefit them, but they are not ready to make big changes, so they question this way of eating as a defense mechanism or form of denial. I fully acknowledge that a ketogenic diet is an extreme change for most people. It takes hard work and dedication. And you have to be really ready for big changes to take on this approach. If you have a question about keto, please ask away in the comments! In general, a keto diet is very low carb, moderate protein, and high fat. Keto is short for ketogenic diet. A ketogenic diet is where you eat in such a way that your body turns to fat as it’s primary fuel source, instead of glucose. The state of using fat as the body’s primary fuel source is called ketosis. This is a natural metabolic state for humans and most of us enter this state each night when we sleep. The one way to get the body into ketosis is to restrict carbohydrate intake and not eat too much protein (the amount of fat eaten does not matter to achieve ketosis). The level of restriction can vary from person to person, and for many, somewhere between 20 – 50 grams of carbs per day will achieve this. Most people following a keto diet eat below 20 grams of carbs per day to ensure ketosis. When a ketogenic diet is used long-term to confer health benefits, it is said to be a “nutritional ketogenic diet”. When you are in ketosis, your body has a steady fuel source (body fat), so your energy is optimal and steady, without any dips or crashes. Most people who rely on carbohydrates for energy need to refuel every 2 – 3 hours because our bodies do not have the ability to store many carbohydrates. It does take a period of adaptation, however, to get the body used to running primarily on fat. This adaptation occurs in two stages: stage 1 is weaning off carbohyrates, which can feel a bit (or a lot!) like going through a drug withdrawal. This stage can last 10 – 14 days for most people. After this initial stage is when people notice the first major improvements, like increased energy and mental clarity, and often a whole host of other health improvements. The second stage is adaptation, where the body begins making more of the enzymes necessary to convert dietary and body fat into ketone bodies for energy. Stage 2 can take 8 – 12 weeks or longer. During this time, energy and mental clarity continue to increase, plus exercise tolerance steadily improves, as well as continued health improvements. You can see exactly what I eat every day by following me on Instagram. I take photos of every meal or snack I eat. Here is a pretty comprehensive list of keto-friendly foods from Ruled Me. For the most part, these are the foods I eat, but I would add organ meats (like liver and heart), and omit artificial sweeteners (like sucralose, Crystal Lite, and aspartame). Actually, the only sweeteners I use, in very small amounts, are erythritol and stevia. 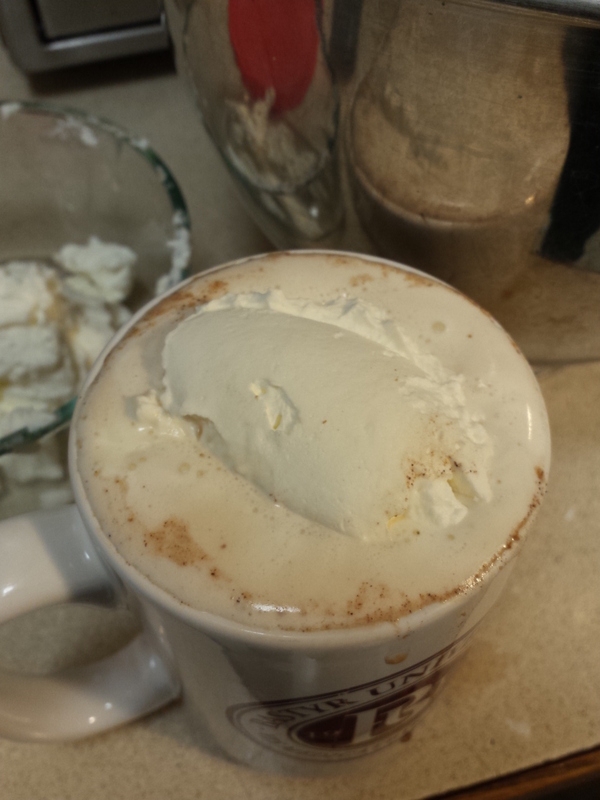 My current formula is roughly: breakfast is a couple of cups of coffee with heavy cream. (I’m not very hungry early in the day, so I enjoy my coffee and eat later when I’m hungry.) Lunch in the afternoon, about 1 – 3 pm, I’ll have a protein (chicken, beef, fish, lamb, etc.) 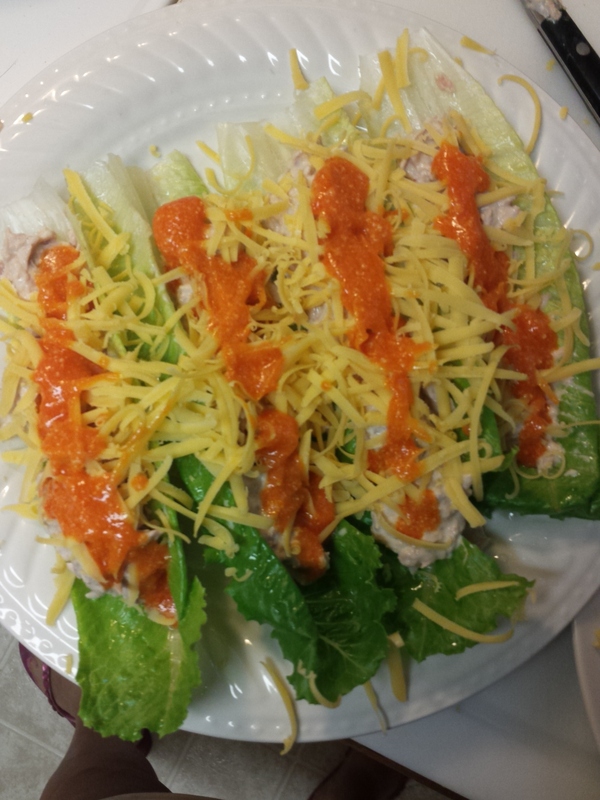 with some veggies (lately it has mostly been salad greens), with some added fat (salad dressing, butter, or Buffalo wing sauce). Dinner is around 7 – 8 pm and is a repeat of my lunch formula. Sometimes I’ll add hemp seeds to my salad or have an once of almonds or have pork rinds dipped in Buffalo wing sauce as a snack. I eat when hungry, not by the clock. I eat until I’m satisfied, but not overly full or stuffed. Keto has allowed me to eat to “hara hachi bu,” which is Japanese for “80% full”. Sugar. In all forms, including refined and natural sugars, even honey and maple syrup, because the carbohydrate count is too high and they still cause a dramatic insulin response in the body, which will kick you out of ketosis (and cause a host of other problems). Flour and Starches. This overlaps some with grains, root veggies and sugars, but I include it to give you a full picture. Grains. In all forms, including whole grains, flours, beer or other fermented grain beverages, corn, etc. Many people think that grains are a good source of B vitamins, however only fortified grains (refined grains) contains high quantities of some B vitamins, however these are synthetic forms and not well absorbed nor utilized by the body. The other foods that I eat (animal proteins and fats) are actually much richer sources of B vitamins than whole grains. We’ve been brainwashed into thinking that whole grains are healthy for us. Now, whole grains are healthier for us than refined grains, but all grains are still primarily empty starch and carb calories. Yes, even quinoa, the supposed “high protein” grain is still 80% carbohydrate! Plus grains contain anti-nutrients that bind to minerals that keep us from even absorbing them. Grains are a cheap, easy to overeat, weight promoting food with very little nutritional value. Milk and Yogurt. Too high in naturally occurring sugars and carbohydrates. Heavy cream and cheeses are fine, however. “What about calcium?” you may be asking. I do get plenty of calcium from cheese, cream, sardines, leafy greens, and seeds. Fruit. Most fruit has been hybridizes to be very high in sugar and carbohydrates, so it really is not as healthy as we’ve been lead to believe. Some people on keto have some berries occasionally, as they are lower in carbs/sugar and glycemic response. A couple of months ago, I tried a 1/4 cup of raspberries and expected them to taste exceptionally sweet after being without fruit for so long, however I found that they tasted too tart and sour now! My tastebuds appear to be changing to prefer fat and not sweet tastes, which makes it easy to avoid fruit since I don’t have a taste for it any more. Root Veggies and underground starchy veggies, like carrots, sweet potatoes, potatoes, yams, etc. While a lot of these are thought to be high in vitamin A, these foods are packed with carbs. Plus there are much richer sources of vitamin A in the other foods I eat (like butter, cream, and liver). Most days my intake of vitamin A is over 500% of the RDA without consuming any root veggies. Many people eating a keto diet will use cauliflower to simulate mashed potatoes, and I can say, it is really delicious. Especially when loaded with butter, cream, cheese, bacon and sour cream! Who would miss potatoes with dishes like that? Is Keto the same as Paleo, Whole 30, low carb, Atkins, or other diets? No, keto is not the same thing as as those other diets. All other diet programs are moderate to high carbohydrate, even if they feel to you like you have cut way back on carbs by following one of these diets. If you are eating any of the foods from the list above of “off limits foods”, then you are not eating a ketogenic diet. The only diet that comes close to keto is the induction phase of the Atkins diet. But Atkins is also different than keto because it only has a person follow this phase for 2 weeks, while keto does this phase indefinitely, even during weight maintenance or even if you have no weight to lose at all. Atkins also does not restrict meat consumption, while keto is moderate protein with a clear protein limit because too much protein can actually kick a person out of ketosis. Atkins is primarily for weight loss, while keto is primarily for health improvements, with the side effect of weight loss (if needed). Many people also think that a low carb diet and keto are the same thing. This is also not true. Low carb diets are typically defined as less than 100 grams of carbs per day. While keto is a low carb diet, you can follow a low carb diet and not be in ketosis if you consume more carbs than 10 grams of carbs per day, or if you consume too much protein. Weight loss does not prove that you are in keotosis, either! You can lose weight on many different diets, so weight loss, even on a low carb diet, does not mean you are following a keto diet. See the “What can’t you eat” question above. Tolerance for alcohol is great decreased on keto. For many people, 1 drink equals 3. The liver is very busy making ketone bodies from fat, and when you introduce alcohol into your system, it has to stop making ketones (or make less) to deal with the alcohol, so weight loss usually stalls (or reverses) when people drink alcohol more than occasionally. For me, my desire to drink has greatly decreased. Those that do choose to drink alcohol on a keto diet, choose low-carb options, like hard alcohol with no-calorie mixers (club soda, water, olive juice) or make a carb allowance for a dry glass of wine (about 4-5 grams of carbs or more per glass). Beer, cider, sweet cocktails, etc. are off limits. Are you going to eat this way forever? At this point, my plan is to eat this way indefinitely. Why would I want to go back to feeling so sick that I was nearly completely disabled? Is it safe to do this forever? How long has anyone ever done a ketogenic diet? A ketogenic diet has been used for a very long time to treat kids and adults with epilepsy. The Charlie Foundation is a great resource. Additionally, here is an MD, Dr. Mary Vernon, that has been following a keto diet for over 13 years. Will you never have another beer or enjoy a piece of cake? What about special occasions? 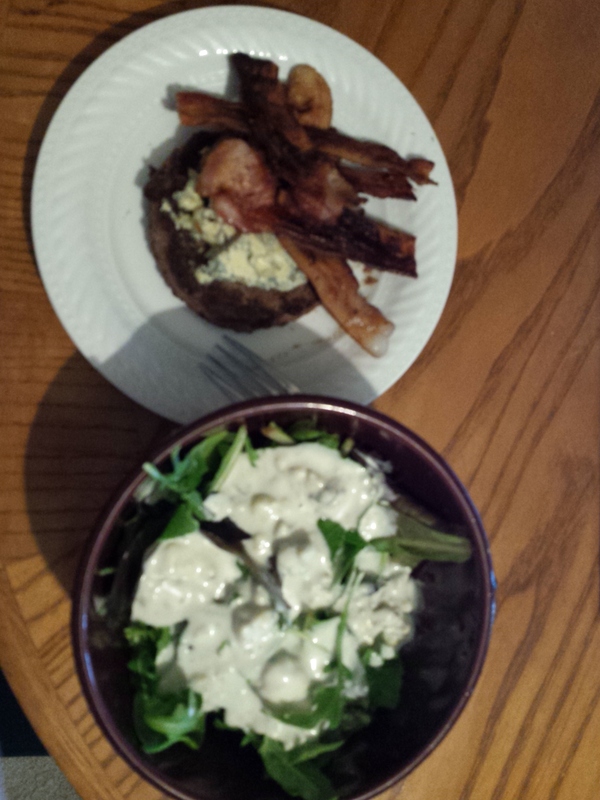 Following a ketogenic diet and lifestyle has to be a mindset shift. For me, this happened early on due to the severity of my health problems. Very quickly after experiencing the tremendous health improvements, I no longer wanted to ever eat a regular piece of cake or have a beer again. Sure, I have cravings for many things, but I have no desire to put those things in my body because of how detrimental they are to my well being. I think many well-meaning people don’t understand just how poisonous some foods are to some people. Would you ask a person with Celiac if they will never eat gluten again? A person with a life-threatening peanut allergy to have a Reeces peanut butter cup? Would you challenge an alcoholic to a few shots on their birthday? To me, too many carbs are poison to me and act just like a drug in my brain (and the same for many, many other people). Research clearly shows that sugars and refined carbs are as addictive, and even more so, than heroin and cocaine. Why do special occasions have to involve highly toxic, addictive substances? Why do we bring these foods to work to “treat” our co-workers? Why do we have drug-filled drive thru restaurants and coffee shops on every corner? Hopefully change will be coming sooner rather than later to shift our thinking about these highly toxic, addictive foods. Won’t you gain all the weight back once you go off keto/go back to normal eating? Yes. If you go on keto just to lose weight, and then try to resume your old eating habits, you will gain all the weight back and probably a lot more. This is not unique to a keto diet though! Any diet, done temporarily, will not permanently make you lose weight. If eating the way you are now is making you fat and sick, then going back to the same way of eating after keto (or any diet) will cause you to return to your former state of fat and sick, which, by the way, is a progressive state. If you keep doing what you are doing now, you will only get sicker and fatter, right? So unless you choose to live a different life with different eating habits, you will not change that path to ill health. A ketogenic diet can have amazing healing affects, but only if it is done long-term. Will keto fix your health so you can resume a normal diet? Keto can be a fix, but it is a long-term solution, not a quick fix diet. At some point in the future, I may be able to increase my daily carbs to 30, 40 or 50 grams to find my carb tolerance. Each person’s tolerance to carbs will be different and many factors contribute to this: genetics, previous eating habits, how long you at that way, stress, nutritional status, etc.). Keto can fix health problems as long as it is followed, but if you go back to your former eating habits, your old health problems are sure to return. Thank you for reading! If you have any questions or comments, please post below. And if you love cheese, you’ll love this dish because I was extra generous with the cheese ingredients: 1 pound of mozzarella and 2 pounds of ricotta! 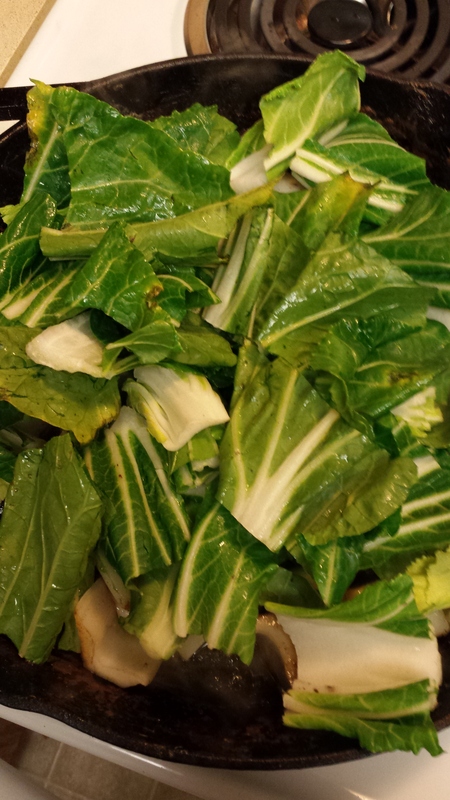 Heat a large pot of water to boiling and blanch the spinach. (Cook in the boiling water for about 1 minute, until it turns bright green.) Remove from heat and pour into colander. Set aside to drain and cool. 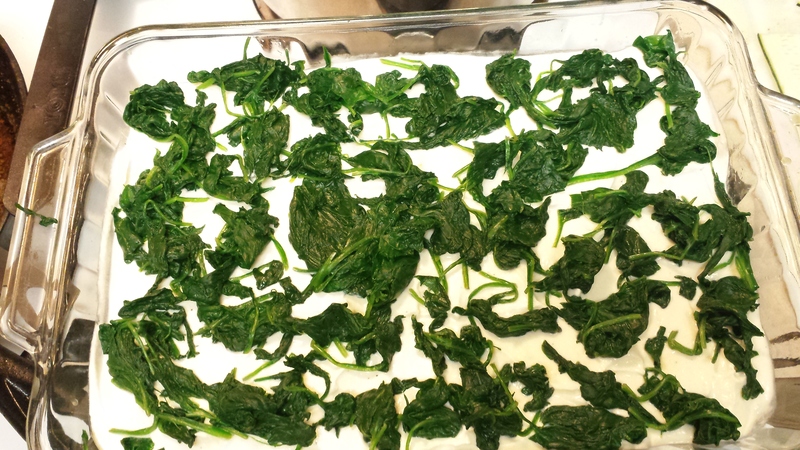 (Alternately, you can use frozen spinach; defrost and drain well.) Squeeze out all excess water once it has cooled. In a medium skillet, cook the chorizo for 3 – 5 minutes, stirring occasionally, until cooked through. With a slotted spoon, remove the cooked chorizo and place into a small bowl, leaving most of the grease behind in the pan. Chop the pepperoni and add to the same bowl. In a small bowl, combine the tomato paste, Frank’s hot sauce, onion powder, garlic powder, 1 tablespoon of the olive oil, and 1 tablespoon of water. Stir to combine. Stir the tomato mixture into the medium bowl of pepperoni and chorizo. Set aside. In a medium bowl, combine the ricotta, eggs, salt, and pepper and stir well. Set aside. In a 9×13 inch glass baking dish, drizzle the remaining 1 tablespoon of olive oil. 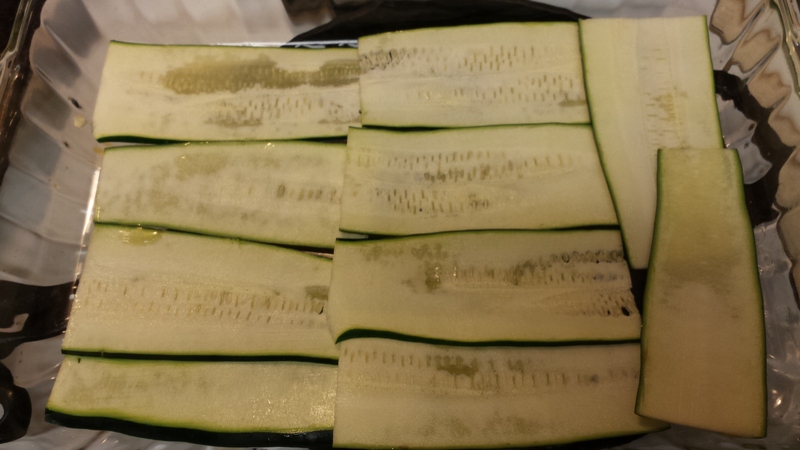 Layer half of the zucchini slices over the bottom of the dish, overlapping slightly if needed. 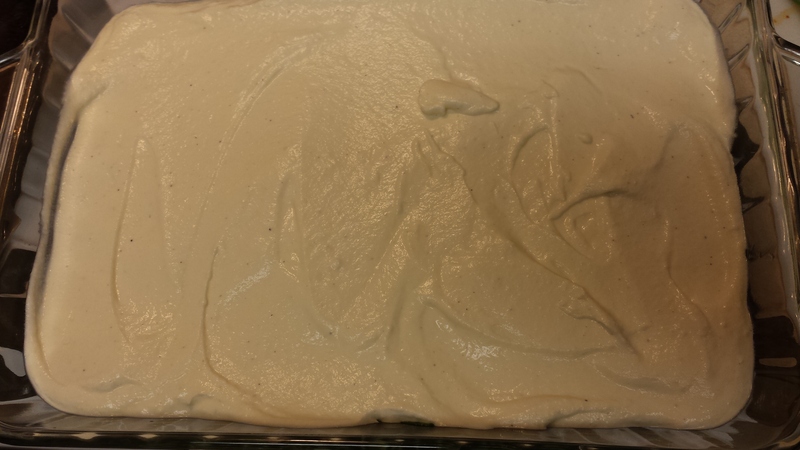 Spread out all of the ricotta mixture over the first layer of zucchini. Top the ricotta mixture with the spinach (be sure to have squeezed out all excess water). Now top with the remaining zucchini, overlapping again, if needed. 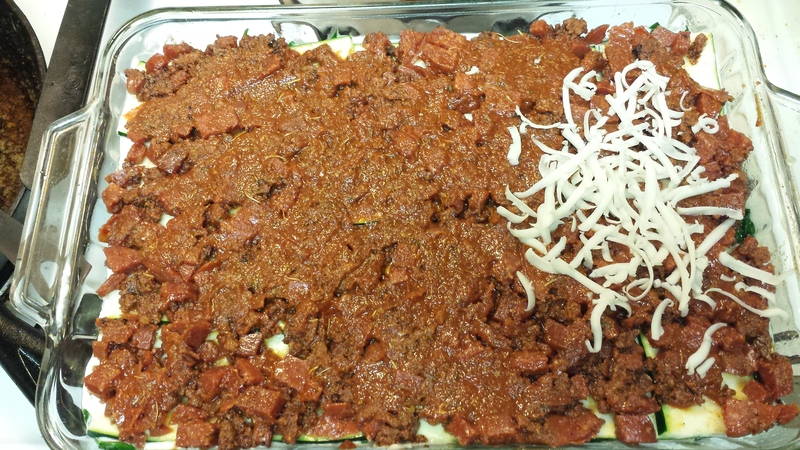 Top with the meat and tomato mixture, spreading out evenly. Next, sprinkle with the mozzarella and Parmesan cheeses and spread out evenly. Place the baking dish onto a sheet pan. Cover baking dish with foil and place into preheated oven for 30 minutes. 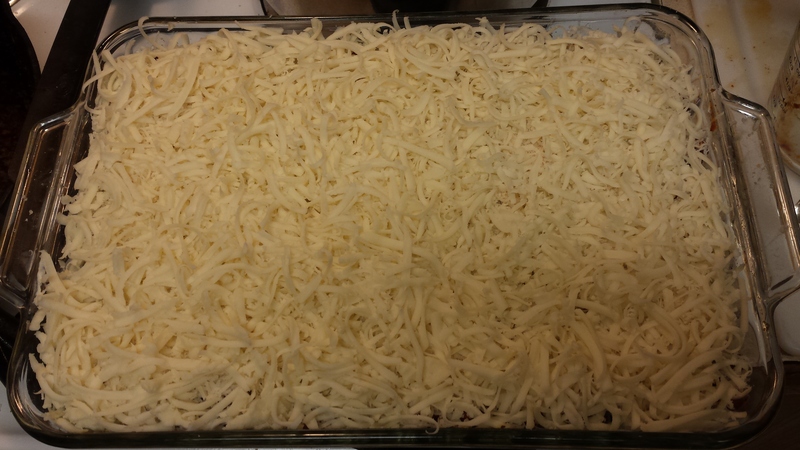 Remove the foil and continue baking for another 20 – 30 minutes, or until the edges of the cheese start to brown and the whole dish is bubbly at the edges. Remove from oven and cool for 10 minutes before serving. Ricotta cheese layer. Creamy goodness. Another layer of zucchini noodles, topped with the meat and tomato mixture (I started to put the mozzarella on before I snapped a pic, oops!). 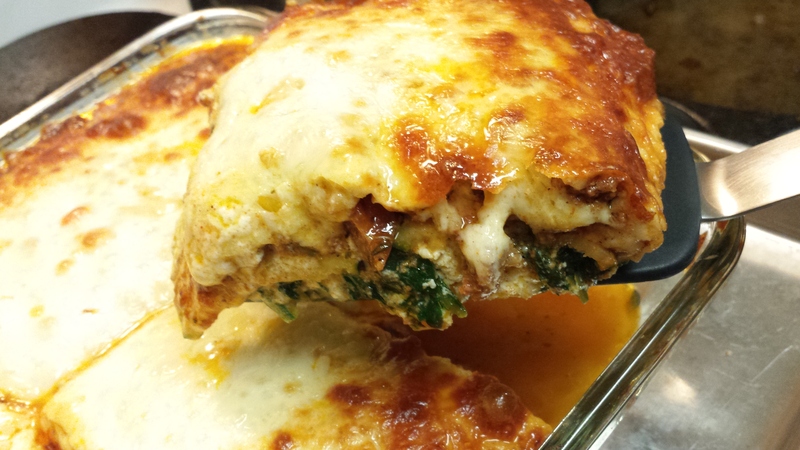 Top with tons of cheese, then cover with foil and you’re ready to bake. Heat a large skillet over medium heat. Roughly chop the bacon into 1 inch pieces. Add to the heated skillet and cook, stirring occasionally, until crispy. Remove bacon from the pan with a slotted spoon and drain on a plate lined with paper towels. 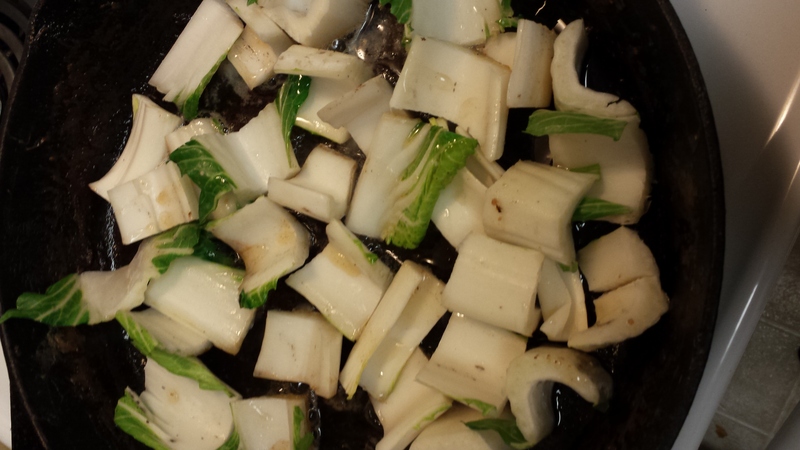 Place the white end pieces of the bok choy into the bacon grease in the already heated skillet. Cook, stirring occasionally, for about 4 – 5 minutes, until the pieces start to brown a bit on the ends. 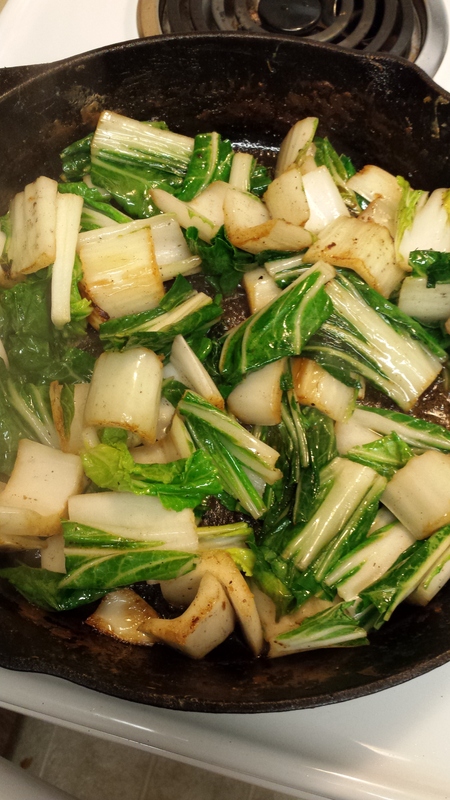 Add the green parts of the bok choy now to the skillet, on top of the white parts. Gently stir. 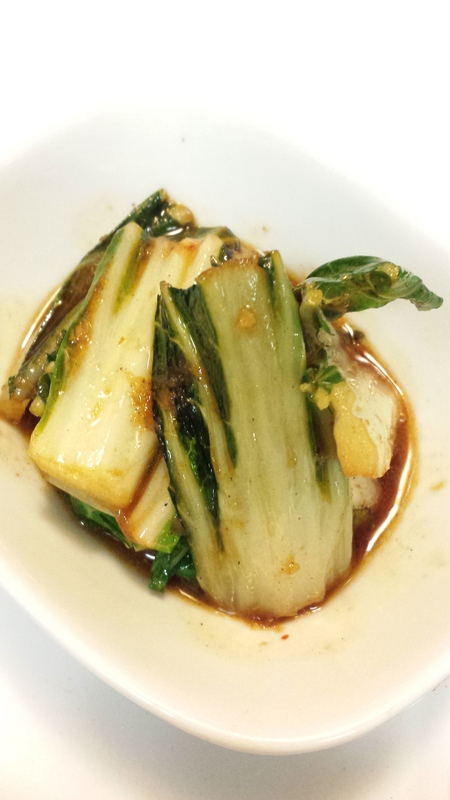 Pour the tamari mixture over the bok choy and cook for 2 – 3 more minutes, until the greens are slightly wilted. Add the bacon and stir. Dish into 6 portions, topping each serving with 1 tablespoon of coconut oil. Serve immediately. 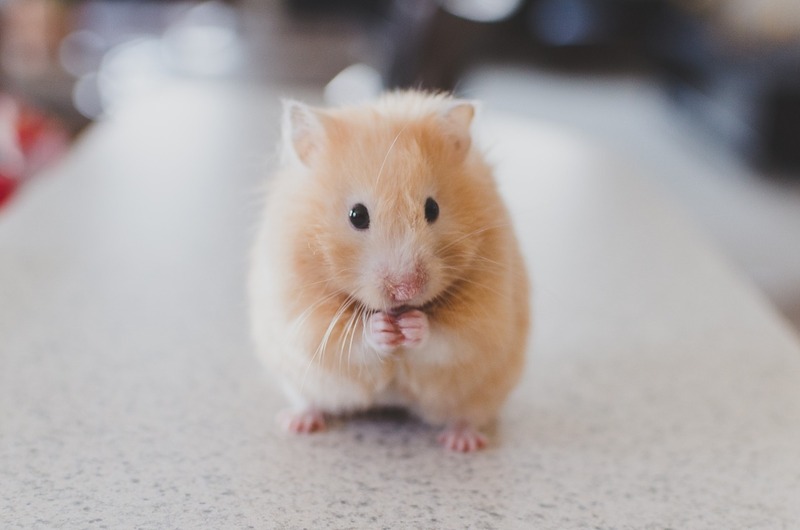 Did you ever have a gerbil or hamster as a kid? Did you ever wonder why and how they could run for hours and hours on their little exercise wheel? Not too long ago, I thought that maybe little critters kept in cages like hamsters and gerbils ran on their wheels out of boredom. I mean, they don’t have hamster jobs to go to; no SeaHamster football team to cheer for; nor TV, Youtube, or Pinterest to look at all day so why else would they run on their wheel except out of sheer boredom? Now that I have been eating a ketogenic diet for 15 weeks, I understand that they likely run for a different reason: their diet is optimized for their metabolism. After my car accident in the spring of 2014, I was not able to do much activity at all due to physical injuries. I spent at least 6 months nearly bedridden over a year and a half’s time, and my muscles were very weak. Additionally, prior to keto, I had almost no energy for activity because of the level of adrenal fatigue I was experiencing from the trauma. Even walking was too much exertion. And even in the ten years before that, I liked to exercise and knew it was “healthy” for me, but it was low on my priority list. Although I would happily join friends for hiking and backpacking excursions (and there was that one summer I did some a group bicycle training), I had little desire or drive to do any activity on my own, or on a regular basis. About week 6 of keto, my energy noticeably improved. (Most people experience improved energy sooner, but I think mine took longer because of adrenal fatigue.) At that point, seemingly suddenly, I had drive and desire to get out and move. I found myself compelled to walk daily. This was an urge that I’d never experienced before in my life. It felt magical! This was not a brain “should” type of desire; it was a body “need” type of desire. My body had energy and lots of it and it wanted to move, move, move. If I had had a running wheel in my house, I probably would have jumped on it and walked for hours. I started out slowly, about 15 – 20 minutes per day of walking, but quickly progressed to 30 – 40 minutes daily. It was easy and enjoyable. Now, my son has been begging me for months (actually, years) to join him at his gym for weight training workouts. I was still experiencing a lot of dizziness and lightheadedness, so I did not feel comfortable in adding this type of workout yet, but I assured him that once this symptom decreased, I would join him. So in the last week, I started a trial membership at my son’s gym. We have arranged specific days that we will go together, based on days and times that sync up on our calendars. In the past, I would have never gone to the gym by myself, so I was glad to have a workout buddy to keep me accountable. But an interesting things has happened. Just like my desire to walk and be active, I find myself compelled to go to the gym now, by myself. And today I did just that. This story needs more explanation though, and some background info. Last week my car radiator blew out (old car) and I’m awaiting the replacement before it can get fixed. Which means that I don’t have a car right now. I was contemplating walking to the gym today (about 30 minute walk each way), since my son had to work, but there was a deluge of rain happening this morning (unseasonable early September storm in the Pacific Northwest). My son offered to drop me off on his way to work, and I could take a bus home if it was still raining. I liked this idea a lot, but he was leaving immediately, which meant I had to change quickly and leave, without breakfast, or even finishing my normal morning coffee. In the past, I would have declined the offer, finding an easy excuse in the rain (and no car) to not go work out. In the past, it was easy to not be active. In the past, my body did not want to be active. In the past, I was not eating a diet that was optimal for my metabolism. In the past, my body worked hard to conserve all my energy because it was storing all that it could, with little left over for extra activity. In the past, it made sense that I had no desire to exercise. But this morning, I hesitate only for a millisecond and quickly grabbed what I needed and headed out the door. I knew that on my keto diet, I would have plenty of energy to work out without breakfast or coffee. Once I was at the gym, I did some core strengthening exercises plus some weight training for my upper body, which took about 20 minutes. Then I moved on to do some cardio on an elliptical machine. My original goal was 30 minutes of cardio, however I found that I had so much energy and desire to keep going, that I prolonged my cardio to 45 minutes. This has NEVER happened in the past. Before, I would have found any excuse to cut my session short, probably only putting in 20 minutes. Again, a magical feeling. After my cardio, I had planned to take the bus home, since I had already got 45 minutes in. But the rain had let up, so I decided to walk the 1.3 miles home. And it was a snap. I had tons of energy. I could have kept walking and walking, too. In fact, I found myself daydreaming on the way home about walking the rest of the way into town (another 1.5 miles) for a leisurely day of shopping after a quick stop at home for a shower. And now I’m at home, sipping the remainder of my coffee. Contemplating breakfast/lunch options. And wondering what I will do next with all the energy I have available today. What would a hamster do?